Players with the engineering skill can purchase the schematic for this pet at the Engineering Works plot in the garrison or from the engineering vendor at the Alliance or Horde faction hub in Ashran. The schematic costs one Secret of Draenor Engineering; crafting this currency has a one day cooldown. Non-engineers can also craft this pet by building the Engineering Works in the garrison, and upgrading the plot to level 3. After obtaining enough materials, speak with one of the NPCs at the level 3 Engineering Works to have them create the pet for you. Launches a rocket at the target, dealing 413 Mechanical damage. Rebuilds broken pets, restoring 472 health to itself, and half that amount to other mechanical allies. Creates a wooden decoy that protects your team from two attacks. I absolutely love this pet for power leveling.I named him Benji. :-) happy hunting!!! My go-to leveling pet. Use Rocket/Pigout/Decoy and can solo most high level Critter/Beast/Flyer teams. 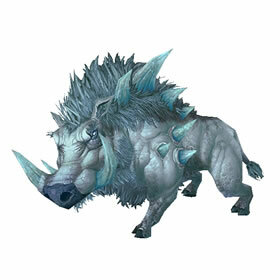 I've done the Frostwall circuit countless times leveling pets and unless unlucky usually only need LMF, and if done right, Pigout will let you finish with full health. Hard to beat in this category. Decent little boosting pet. Can easily boost 2 pets on many trainers with Pig Out/ Decoy making this very hard to kill. Don't really use it much in PvP battles though, it just doesn't seem as good as others with decoy (MPD for example is just better because of Thunderbolt). This little pig's moveset and S/S breed (325 speed) look promising (other than Charge, which seems misplaced). Her 'Pig Out' damage + heal move brings Son of Animus to mind, and 'Decoy' is a mainstay defensive move made popular by Darkmoon Zeppelin and Mechanical Pandaren Dragonling. Missle, Rebuild, and Headbutt are all useful moves as well. IMO her only drawback is cosmetic - maybe she is a bit *too* lifelike...? After many complaints that taming young boars was a painful experience, engineers came to the rescue with this creepily lifelike model.